There is something comforting about being in a large kitchen surrounded by pleasant aromas and great tasting desserts. Holiday memories revolve around the kitchen and the time spent in preparation for the “big day.” During the hustle and bustle that comes with cooking and preparing for the “big day,” unexpected and unplanned mishaps often occur. Most people have a holiday memory that involves kitchen preparation mishaps such as: melted plastic spoons, gizzards left and cooked in the turkey, homemade caramel popcorn that was notorious for breaking teeth and burnt, barely recognizable entrees. It is during these little mishaps that one is grateful for their kitchen exhaust vents because without it, the little mishaps that occur in the kitchen might not be so memorable. Kitchen exhaust vents installed in homes to help elevate hazards such as heat, moisture and smoke from the occasional “uh-oh.” When one uses his or her stove, heat rises and gets trapped. When a stove burner is used to cook or steam food, moisture rises into the kitchen exhaust vent as well. When heat and moisture is trapped with no where to escape, dangerous hazards could occur. Kitchen exhaust vents are usually installed above the stove to help pull out the heat and moisture that is created while the appliance is in use and pulls down or pulls in air from outside. 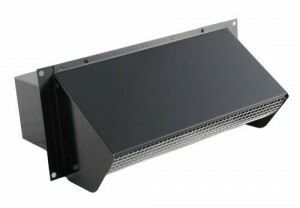 Kitchen exhaust vents also work as an odor eliminator, drawing out the unpleasant reminder of what was almost dinner. Installing a wall vent is not exactly rocket science; however, most home repair projects are never executed as smoothly as one would like so. It might be the homeowners best interest to keep emergency contact information available for those who may be assisting with the project.